The BBC is in talks to resurrect another ’70s SF show, Survivors. The brainchild of Terry Nation, Survivors lasted three series from 1975 and focused on a post apocalyptic world peopled by survivors of a devastating plague. It is understood that the BBC wants to make a new series of six hour-long episodes. The project’s being overseen by Beeb producer Sue Hogg. But a deal has yet to be finalised and the BBC is still in negotiations with Nation’s estate. Although Nation owns the rights to the series, he left after season one, going on to create Blake’s 7. SFX, No. 147, September 2006. The Media Guardian story was also covered in Dreamwatch magazine. 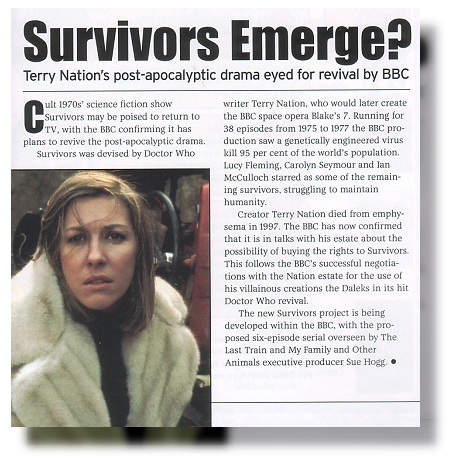 Following the publication of the announcement in the Media Guardian on 10 July 2006 of the forthcoming revival of Survivors by the BBC, the story was picked up by Dreamwatch magazine No. 144, dated September 2006. Cult 1970s’ science fiction show Survivors may be poised to return to TV, with the BBC confirming that it has plans to revive the post-apocalyptic drama. Survivors was devised by Doctor Who writer Terry Nation, who would later create the BBC space opera Blake’s 7. Running for 38 episodes from 1975 to 1977 the BBC production saw a genetically engineered virus kill 95 per cent of the world’s population. Lucy Fleming, Carolyn Seymour and Ian McCulloch starred as some of the remaining survivors, struggling to maintain humanity. Creator Terry Nation died from emphysema in 1997. The BBC has now confirmed that it is in talks with his his estate about the possibility of buying the rights to Survivors. This follows the BBC’s successful negotiations with the Nation estate for the use of his villainous creations the Daleks in its hit Doctor Who revival. The new Survivors project is being developed within the BBC, with the proposed six-episode serial overseen by The Last Train and My Family and Other Animals producer Sue Hogg. The Media Guardian story was also covered in SFX magazine.